فردریک ویلهلم نیچه (۱۵ اوکتوبر ۱۸۴۴–۲۵ اوت ۱۹۰۰) آلمانلی فیلسوف، یازار و شاعیریدی. 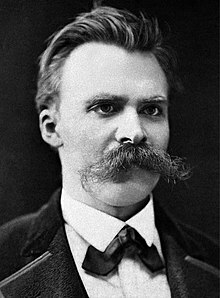 ↑ "Friedrich Nietzsche,"[اولو باغلانتی] by Dale Wilkerson, Internet Encyclopedia of Philosophy, شابلون:ISSN, retrieved 14 October 2015. ↑ Brobjer, Thomas H. (2008). Nietzsche's Philosophical Context: An Intellectual Biography. University of Illinois Press. p. 149. ISBN 978-0-252-03245-5.